I started to write “guest blogger” here and it just seems wrong to call Tarah a “guest”. Tarah’s been with us for a year and a half (pretty big deal in the small biz world) – helping to make the store run, look pretty, and she helps keep me on track. 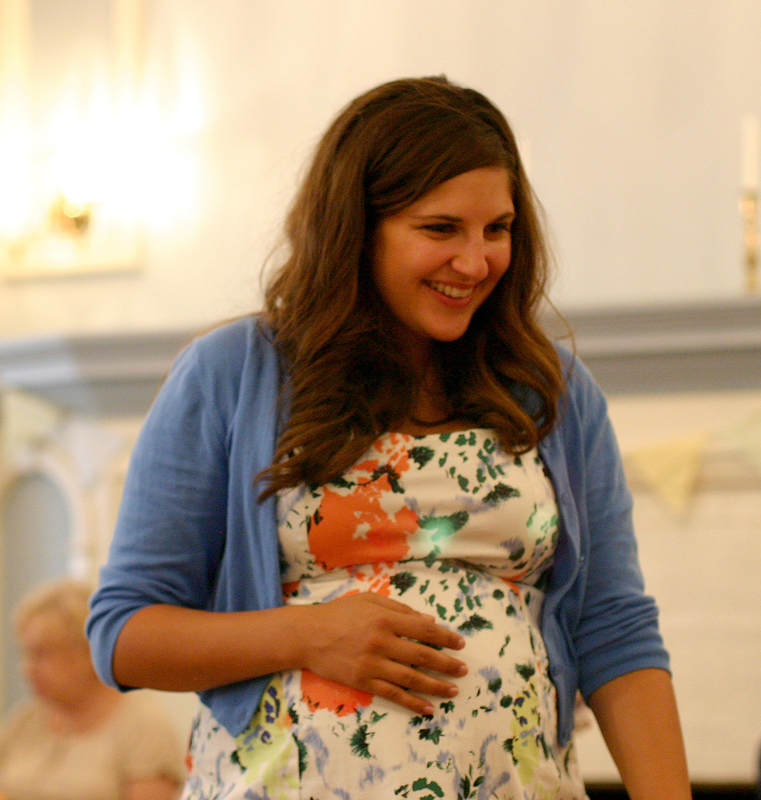 She’s not exactly leaving us, but she will be around in another form – as a Mama! We’re excited to welcome her new addition into this world soon, but we will greatly miss seeing her at the store. You should expect to see more of her in other ways after things with the new little one are settled in. For now, I wanted her to share a little about her lovely baby shower. One that I was honored to attend, and am excited to share. Cause ‘ya know, thats what we do – celebrate celebrations! Anticipating a new baby is a constant dichotomy between extreme excitement and trepidation, and nothing eases that burden like being surrounded by women who love you, want to support you, and have been there themselves. Before our little man even witnesses his first glimmer of daylight he is already cherished and will grow the love of the community that surrounds us. Nothing makes this more clear than a baby shower! We were bombarded by love and baby essentials a few weeks ago at St. Cecilia’s Music Center in downtown Grand Rapids. The tone was set for our old-fashioned ABC theme through a custom stationery design by Abbey at 6.25 Paper; they were perfect (and extra special since this is where I work!). The ABC theme was carried through in the room decorations with bunting, ABC blocks galore and flowers from our local farmer’s market – the same vendor who did our wedding! The food was absolutely delicious and diverse, ranging from goat cheese stuffed dates and a fresh Michigan cheese board to a tomato and cipollini onion salad and lentil falafel croquettes. To top it off, all of the adorable bite-sized desserts were homemade! Our favors were one of my favorite Trader Joe’s goodies, mini cinnamon ABC cookies that we wrapped in party bags from the 6.25 Paper store. Everything turned out beautiful! …and now we wait for the baby to make his debut! of the great Grand Rapids local resources for party goods and services. 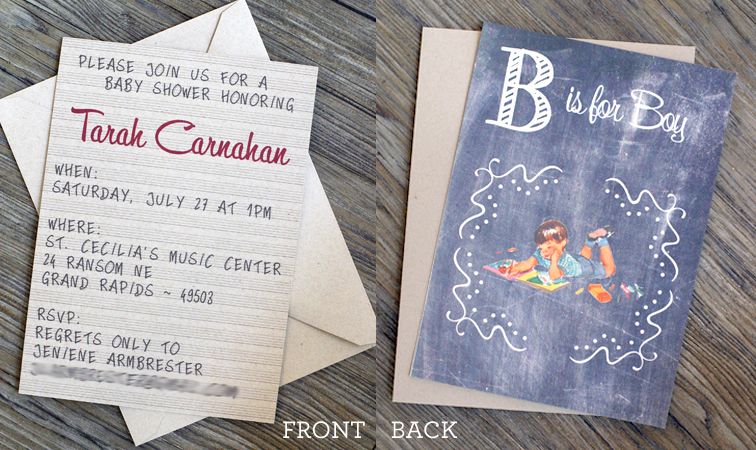 Shameless promotion… I’m always available for custom invitation orders for any occasion (not just weddings:). Email me for a quote! Plus we sell fun fill-in invitations at the store and online if you are in more of a time crunch (these are also available wholesale).